The research unit LOCI-VUB is pleased to invite you to partake in the matchmaking mission of KIBII WI KONI Research Center (Moengo, Marowijne, Suriname). Interested research units and individual researchers can subscribe for an introductory acquaintance meeting on December 7th or December 9th with the founders of KIBII WO KONI Research Center, artist Marcel Pinas and project coordinator Donovan Pramy. Please contact Bieke Abelshausen to arrange a meeting. On December 8th Marcel Pinas and Donovan Pramy present their project and its origin during a lecture held at the ‘promotiezaal’ D2.01 from 1 to 3 pm. The lecture illustrates the Marrons of Suriname, the usage of culture and arts as a means for development, and the potential of traditional knowledge in our modern world. The lecture is open to the public and specifically encourages students to participate. Please note that the lecture is in DUTCH! Meetings concerning the matchmaking can of course take place in English. KIBBII WI KONI Research Center contributes to the preservation of authentic cultural traditions of Marrons by increasing awareness in younger generations on cultural values and by increasing the accessibility of the Marron culture to the general public. This is achieved via research, activation, education and cultural expressions. KIBII WI KONI initiates and stimulates scientific research to achieve a just and equitable balance between researchers and local knowledge actors and to apply this interaction as catalyst for both academic purposes and local development. 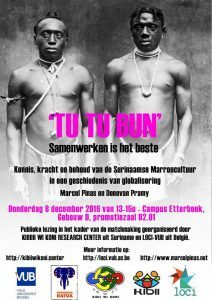 Marrons of Suriname are descendants of the African people who were forcefully brought to Suriname by slave traders. In Suriname, they freed themselves from slavery and settled in the primeval forest. The Surinamese Marron culture is sometimes referred to as the best-preserved piece of Africa outside the African continent. It has however always been an alone-standing, ever-moving culture. Wars, land grabbing, natural disaster and migration have characterized the Marron history. The culture is simultaneously characterized by a specific pride in identity and a vitality that not only appeals to the imagination but also inspires every society. Cultural dynamics are the crystallization in material and immaterial traits of the drive of humanity to survive, defend itself, grow and develop, and to realize dreams in concert (Sankatsing, 2004). LOCI was founded in 2016 as a transdisciplinary research unit and open-knowledge network encompassing challenges in development themes. The aim is to bridge various forms of knowledge that are otherwise divided by specialization or by the tension between tradition and innovation and between globalization and local strength. Local initiatives, resilient communities, social interactions, and the additional values of merging different perspectives form the foundations of LOCI. Hetgeen ik niet bezit, kan ik niet delen of overdragen aan de komende generaties (Marcel Pinas & Donovan Pramy, 2016). Various research is undertaken in and with the Marrons in Marowijne. Anthropologists, (art) historians, biologists, sociologists, geologists and ‘agogen’ find their way to this area which is full of potential. The gained knowledge however often travels back with the academics without taking into account the ownership of the actors of these local knowledge forms, and without recognizing the potentials of exchanging gained knowledge on the development, identity and cooperation perspectives. Whereas Marowijne is subject to extraction economies, researchers also run the risk of taking part in a similar extraction logic. It is for this reason LOCI-VUB invites you to this matchmaking event to contribute to the recent initiative of the KIBII WI KONI Research Center to house and foster academic research, cultural exchange and social interaction under one roof in a local knowledge center in Moengo.